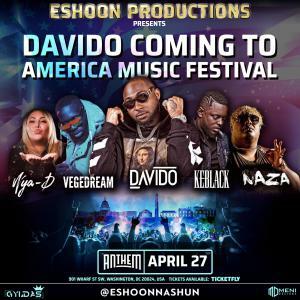 WASHINGTON DC, UNITED STATES, April 2, 2019 /EINPresswire.com/ -- Davido, the Nigerian-American singer, songwriter, and producer behind the mega-hit ‘Fall’, is headlining the Coming to America Music Festival Saturday, April 27th at Anthem in Washington DC. The once in a lifetime international music festival, executive produced by Eshoon Productions, will also feature French and African stars including Vegedream, Keblack, Naza and Nya-D.
A worldwide hitmaker since 2011, Davido is currently riding high in America on the success of his latest release “Fall”, a Top 10 smash on urban radio and streaming services all over the U.S.A. “Fall” also holds the distinction of being the first Nigerian music video to reach 100 million views on YouTube and the longest charting Nigerian pop song in Billboard history. “Fall" is a Top 100 most “Shazamed" single in America and top 10 “Shazamed” title in New York City (Shazam is an Apple Music app that can instantly ID songs and other media users are curious about). For Davido, who was born in Atlanta and was educated in Lagos, his collaborations with Meek Mill, Busta Rhymes, star-making appearance at the 2018 BET Awards, 10 million Instagram followers and sellout shows worldwide including London’s O2 Arena have cemented the global artist’s appeal to western audiences. Also appearing on Coming To America Festival stage are Vegedream, a hip hop, R&B, and urban pop singer-songwriter originally from Ivory Coast signed to Universal Music France, best known for his hit “Ramenez la coupe à la maison” that peaked at number one on the French singles chart, Keblack from Congo whose certified diamond track “Bazardée” garnered 202 million views on YouTube and his 2017 release “Premier étage” which was certified gold, Naza, the French rapper also from Congo with Bomayé Musik behind the hit albums, Incroyable and C'est la loi, and Nya-D, a young French Moroccan artist making her U.S. debut. Eshoon, executive producer of Davido’s Coming to America Music Festival, is an entertainment triple threat; she is a talented singer, songwriter, and CEO of Eshoon Productions. Eshoon's goal is to "inspire people, to get out there and do it...no matter the age and societal circumstance of life". She will be singing songs from her self-produced EP titled “Eshoon” produced in France.